A second sanding of the joint compound is conducted and yet another coat of joint compound is added to the surfaces to smooth out the area in full. This will be the final coating of joint compound. Some people are very good at house repairs while some rely on experts or professionals to do it. Those who are too busy and do not have time to do it are the ones who usually hire a handyman. There are also those who are not into working with tools so they do not like to do it. There are repairs that must be done by professionals, but a lot of home repairs can also be done by the house owner. The problem is they just do not have time or they do not know how to do it. When time is the problem, that is a hard thing to fix but when your problem is with the instructions on how to do it, then that could be solved easily. There are so many places where you can find steps on how to fix materials and stuff in your home. Replacing lights and fixing the locks are easy because of the simple instructions that could be found online or in books. There are steps for beginners who do not know a lot on repairs and there are also instructions for experts who can understand and know the terms and tools that are used. Drywall texturing steps are composed of just a few guidelines. The best way to do it is to repair with three or four thin coats of compound while sanding on just the last one. An important tip is to build the joint out wider than normal and leave shallow slopes on all sides. The first thing to do is to apply the mesh sheet coating on one side before applying mud so that the steel will be embedded in the mesh while reinforcing the repair. A light-weight or all-purpose compound could also be applied over it to maximize the strength of setting the mesh tape. A paper tape is also good to use if you are most concerned about strength. After setting the mesh repair across the hole, start the application of drywall compound. Spread the joint compound one more time on the tape and scatter it evenly on the wall using a drywall blade. When the mud compound is dried, sand it. Repeat the action until the wall is flattened without any marks of the tape. Make sure to allow ample time for the drywall compound to dry before beginning to apply a new coat. Depending on the method of application, drywall texturing styles are grouped into two categories. Some textures are applied manually with handheld tools and are thus referred to as hand textures. The other group, sheetrock textures require machines to spray the compound into a previously prepared area and cannot be effectively duplicated without a machine. If unsure what type of texture should be implemented in your repair, it is best that you consult a specialist so that he/she can give you a gracious estimate. Otherwise, you can decide based on the availability of materials. For minor repair, handheld texture is the more practical option. 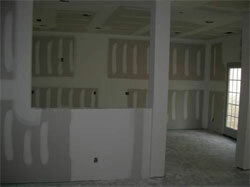 Drywall repair is oftentimes regarded as a complicated or strenuous activity. However, if geared with the right materials and detailed information, anybody can do minor repairs without professional help. Just follow these drywall texturing tips and you are on your way to doing textured drywall like a pro!